Pebble Beach is world-renowned for being one of the most beautiful golf courses on Earth. The golf resort is dotted with million dollar mansions and frequented by some of the wealthiest people on the planet. It truly is a golfer's paradise. Two years ago, a young 16-year-old freediver named Alex Weber was swimming off the coast in Carmel Bay. Weber says she had been diving since she was a young child, so the underwater world was nothing new to her. But this time she saw something she didn't expect. 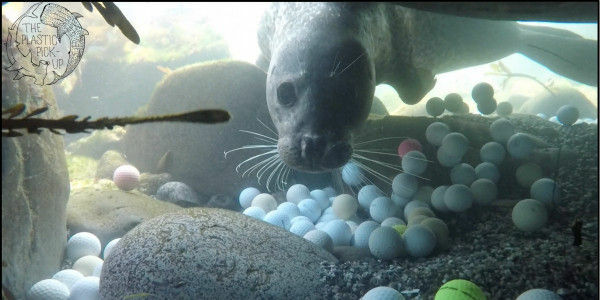 Instead of sand covering the seafloor, she saw nothing but golf balls — thousands and thousands of them. Weber knew this wasn't good. Golf balls are covered in plastic, and like any plastic material that finds its way into the sea, they degrade over time, releasing microplastics and other toxins into the ocean that marine life ingest. Weber said that even as they made their regular diving trips out to remove more golf balls, they could hear the "plink, plink" of more balls hitting the ocean from golfers at nearby resorts. The Pebble Beach Company (PBC) — owner of Pebble Beach and two other courses along the coast including The Links at Spanish Bay and Spyglass Hill — charge big money by offering a chance to play at this stunning course. They can charge exorbitant green fees ($525) because the links are pristine and beautiful. But management has failed to keep the entire area in equally as tip-top shape. For PBC officials, out of sight means out of mind. Over the years they have allowed thousands of golf balls to pollute California's shore. That is unacceptable. The PBC must take responsibility for the golf ball pollution caused by their guests and rid the sea floor of them at once. Additionally, they should take extra steps to make sure more balls don't make their way into the sea, perhaps by erecting a net to stop stray balls. Sign the petition to tell PBC and other coastal and river golf courses to clean up their mess.